Some of you know that I make guitars. Among luthiers, there are factions referred to as right and left brainers. The left brainers tend toward strict mathematical method, while right brainers work more organically from intuition. Truth is, few builders are purely one or the other. The same thing can be said of chefs. In both pursuits, I tend toward right brain creativity, informed by formal training, experience, and the hard and fast science behind cooking. Add to that the fact that I really don’t care for being told what to do without some information behind the direction, and you’ve pretty much got the heart of what drives UrbanMonique. Now about that cilantro. I love the stuff, so it’s always in our kitchen, fresh and/or dried. Recently, plans that included a lot of cilantro fell through, so we had too much on hand. This herb has a short shelf life, so something needed to be done right away to preserve rather than waste. We decided on pesto, and that we’d use whatever else was on hand, building a variant we’d not done before. This is what we came up with, and it’s stellar, frankly. The rich, buttery flavor of the avocado oil and feta balances perfectly with the tang of the lemon and herbaceous base of cilantro. Here’s what we did. P.S. 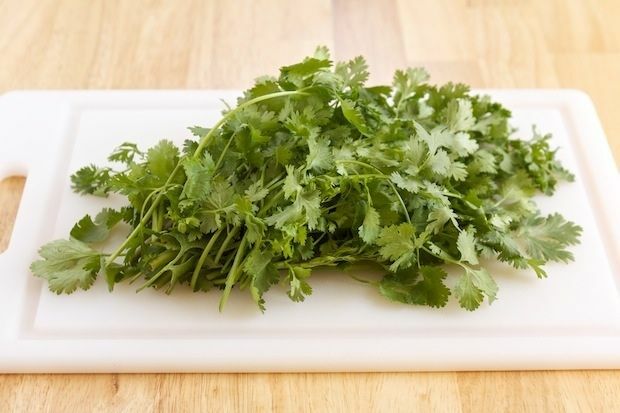 Yes, I know some of you don’t like cilantro. Tough luck, that… We are working on a piece that speaks to the science behind your malady, so stay tuned. Process everything but the oil, salt, and pepper in a food processor or blender until thoroughly incorporated. With the processor or blender running, (Low speed if you’ve got one), add the oil in a slow, steady stream. Stop when you hit the consistency you like. Taste and season to taste with salt and pepper, and adjust lemon if needed. Freeze leftovers as needed. Pesto works great in an ice cube tray, frozen. Just pop out a cube when you need one. Here are Cilantro Pesto I and Cilantro Pesto II if you’ve not tried them already.